The greatest problem for a retailer is when goods leave the retail store or the warehouse without a matching payment. In retail vernacular it’s called “shrinkage”. Retail shrinkage is the difference between book stock and actual stock. Shrinkage is an industry hazard. According to the second annual Global Retail Theft Barometer 2008 Survey, covering 920 large retailers across 36 countries, India is rated with the highest shrinkage rate at 3.10 per cent which is an increase of 6.9 per cent over the year before that. However, the average shrink percentage in the retail industry is about two per cent of sales. The rate of retail shrinkage helps determine the proceeds of the business of the retail firm. Everyone in the retail world is aware of shrinkage but the scale of it has rarely been measured or admitted by the retailers. 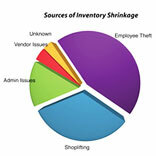 The causes of retail shrinkage are mainly employee theft, shoplifting, administrative errors and vendor fraud. Employee Theft: Not everyone would know that employee theft stands higher than shop lifting when we talk of shrinkage. Since employees know the business processes very well, they tend to become more audacious. This leads to employee frauds ranging across a wide number of activities. Unfortunately, this is one loss prevention area that generally doesn't receive as much monitoring as in the case of customer theft. And if an employee gets away with it once, he is likely to repeat his actions. Shoplifting: Referred to as five-finger discount in Australia and US, and jacking, chaving and nicking in the UK, according to studies it shows that one out of twelve customers might be a shoplifter. There may be two types of shoplifters: An occasional shoplifter and an informed shoplifter. Administrative Errors: Administrative and paperwork errors such as mark up and mark down of the prices cause around 15 per cent of the retail shrinkage. Shrinkage in any retail store exists, as a retailer you can adopt a few measures to keep a check on shrinkage. Though it can’t be eradicated completely, it can definitely be lowered. Constant vigilance is a tactic that all the retailers need to adopt at every moment to tackle shrinkage. A daily check on high valued items and regular checks on the not too high valued products is a must. The benefit of daily checks is that if an item goes missing, instant action can be taken. You can link financial incentives to shrinkage rates and reward positive behaviour among your employees. There should be no dead corners in the store giving way to plenty of open, well-lit spaces and wide aisles to ensure high visibility. RFID (Radio-frequency identification) and other security products play an outstanding role to combat retail shrinkage and prevent shoplifters and employees from sliding expensive products into their pockets. Point-of-sale data mining software solutions help detect potential theft problems at the cash register and alert appropriate personnel in real-time. Source tagging is another way to keep a count of the merchandise. Self-alarming anti-theft tags sets aloud an alarm throughout the store when someone attempt to inappropriately take out tags from goods. Constant monitoring through closed circuit TVs keep people on vigil that they are being watched. So in case you are a victim of shrinkage, you can put these measures in place and you sure will see the difference.